Your child will spend seventeen years in a classroom from Kindergarten through college; why put him in an institutional setting sooner than you have to? Amy & Kids Co. preschool child care program helps children get a great start on learning in a comfortable home learning environment. 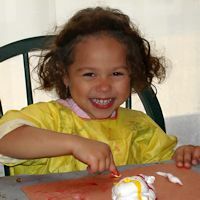 Preschoolers are curious, with a natural desire to learn new things and become more independent. Studies have shown that play-based child care programs like mine help preschool children and acquire the skills they need to succeed in kindergarten and beyond. Children who are two years through five years and not yet enrolled in school full time are considered part of the "preschool" child care program. No additional enrollment is necessary; children naturally progress from infant and toddler activities to preschool type activities when they are ready. The years before a child enters kindergarten are among the most critical in his life to influence learning. Amy & Kids Co. preschool child care program provides positive relationships, and play-based learning in a safe environment where your child will thrive! A warm, stimulating environment set up for exploration and active, hands-on learning. A friendly, caring, well-educated caregiver. A wide variety of age and developmentally-appropriate materials that reflect cultural diversity and nonsexist attitudes. Daily activities that encourage self-expression, promote small and large motor skills, and expose the children to literature, the language arts, music, science, and nature. 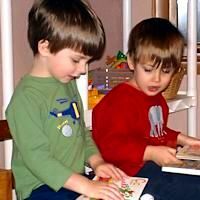 A balance of individual and group time; spontaneous play and teacher-guided activities; active play and quiet play. Learning centers that enable learning through imaginative and creative exploration. Continued American Sign Language (ASL) signs taught through daily interactions, songs, and fingerplays. A flexible daily routine that allows for teachable moments. Nutritious family-style meals and snacks where the children set and clear the table, serve themselves, and practice good table manners. Assistance with toilet learning as appropriate. Clear, consistent guidelines that encourage common courtesy and respect for themselves, others and for property. Support and encouragement for parents and families. A variety of scheduling options are available to meet your family's needs, including full time care, full day care and AM/PM care. Please see the child care schedule page to see which schedule best fits your family's needs. Tuition costs for preschool child care depend on the number of hours your child is in care as specified in your contract. Families with more than one child enrolled will receive a discount on the oldest full time child's tuition. 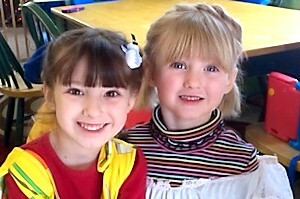 Please visit the child care tuition page for complete tuition information. Children do not need to be "toilet trained" to participate in preschool child care activities. I am happy to assist you as your child learns to use the toilet; see the full toilet learning policy for the complete toilet learning procedure as well as tips to make toilet learning easier for you and your child. Eventually your Preschooler will become a Kindergartener and start attending school full time. Watching one of “my” children start full-time school is bittersweet for me: I'm proud of how much they learned while in my care, excited about the new experiences they will be having, but sad because I'll miss them while they're in school. If your child needs care before and after school, I would be thrilled to have him in my school age program! However I do realize that many parents make other arrangements when their child begins full time school. If this is the case, I would appreciate your taking a moment to write a brief note about the care I provided for your child. Your comments will be posted on this website for prospective parents and other visitors. Thank you so very much!